Gionee has launched a device with a massive battery of 5000 mAh which is first of its kind and Gionee is trying to set a benchmark to other companies who are set on increasing power but not the battery of smartphones. There are other smartphones which sport battery around 4000 mAh but this is the only one which is around the 5000 mAh mark. The name “Marathon” aptly suites the device because of its massive battery which will make the smartphone run like a marathon. Gionee Marathon M3 sports a 5 inch HD display and runs on a 1.3 GHz Mediatek MT6582 quad core processor, Mali 400 MP2 GPU. the device has 1 GB RAM and 8GB internal memory which can be expanded to 128 GB using microSD card support. the device comes with a 8MP rear camera and 2MP front facing camera. Gionee MArathon M3 runs on Android Kitkat 4.4 operating system. It comes with Dual SIM support and has all the basic features like 3G, WiFi, Bluetooth 4.0, GPS with A-GPS and the most important aspect is the 5000 mAh battery which is the best battery which is at offer for any smartphone and hope this brings a change in the battery segment of high end smartphones. With increase in Dispaly, Performance and RAM and processor speeds and other features the battery life of all smartphones in decreasing without much improvement in the battery specifications. This is a welcome change with a 5000 mAh battery which must give you 2 days of battery life under daily use. Another thing which should be considered is the time which it takes to charge which is not yet known. 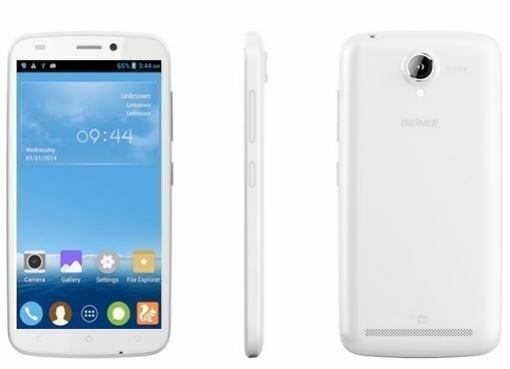 The pricing of the device is rightly done by Gionee at Rs. 13,999 in the Indian market and available in eBay India.